The US Agency for International Development (USAID) named the USAID Health Care Improvement Project (HCI) one of five winners in its first-ever “Excellence in Evaluation” contest. The contest recognized the best evaluation reports undertaken by USAID-funded projects. The winning report evaluated the results of 27 health care improvement interventions in low- and middle-income countries carried out by HCI, which is managed by University Research Co., LLC (URC). “This study was the first time...that we had pulled together results from so many different applications of this approach, and so it really caught a lot of people’s attention,” said Ms. Marquez in the video. This study builds on more than four decades of evaluating and improving programs using evidence-based standards. We are honored to receive this recognition from the USAID Bureau for Policy, Planning, and Learning. 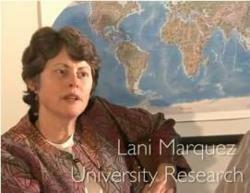 USAID recognized the award winners in a short video that features Ms. Lani Marquez, HCI’s Knowledge Management and Communications Director, who co-authored the report, and Dr. James Heiby, Medical Officer in the USAID Global Health Bureau. Collaborative improvement involves a team-based approach to quality improvement. Teams consisting of health care workers in clinics, hospitals, and other levels of the health system work together on common aims to improve particular aspects of the system. The teams test changes in health care processes, share their experiences and then apply the successful changes on a wider scale. Established in 1965, URC is a global company dedicated to improving the quality of health care, social services, and health education worldwide. With our non-profit affiliate, the Center for Human Services (CHS), URC manages projects in over 40 countries including the United States. Based in Bethesda, Maryland, URC has more than 850 employees around the world.